You are here: Home / Uncategorized / Visit Stratedigm at AACR 2019! Visit Stratedigm at AACR 2019! 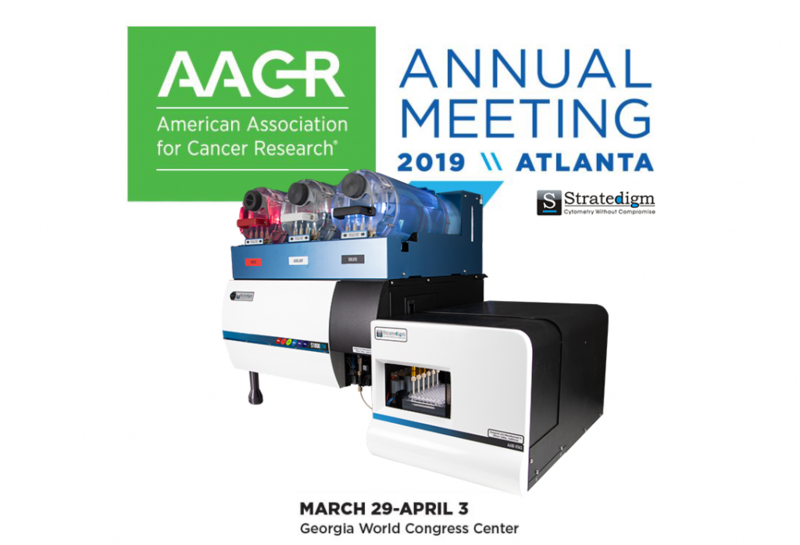 The American Association for Cancer Research (AACR) will be hosting its annual meeting in Atlanta, GA this March 29-April 3, 2019. Come see us at our booth to discuss our latest technologies and innovations! We’ll be displaying our flagship model S1000EON flow cytometer—a configurable, upgradeable, and scalable 6-laser, 30-parameter flow cytometer. We’d also like to highlight a talk that will be happening at AACR. The team over at PerkinElmer has done amazing work and their forward thinking will provide AACR attendees with a high-value look at metal-based therapy drugs using single cell ICP-MS.
2019 is looking like another great year for Stratedigm and we’re excited to share our latest announcements with new and existing customers alike! To learn more about AACR and their phenomenal annual meeting visit their website here. Connect and continue the conversation with us on LinkedIn! And stay tuned for more exciting news! To learn more about our future-proof instruments with investment protection, please contact info@stratedigm.com, visit us at our website, or our YouTube Channel.